“Yield stinging nettles to mine enemies ; And when they from thy bosom pluck a flower, Guard it I pray thee, with a lurking adder...”. “You touch the hoky poky and you turn around”, ow that bloody hurts, meet the Dartmoor Urtica dioica, because hoky poky, along with sting-nittle, are the local names for the humble stinging nettle. 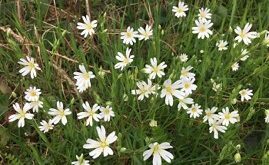 As with most places this plant is widespread and grows with abundance especially in the fields and hedgerows of the lower moor. For centuries the stinging nettle has featured strongly in the realms of folklore, tradition and hedgerow medicine. Probably the most noted property of the stinging nettle is it ability to inflict a temporary, itchy skin rash or as its name suggests – sting. This irritation is caused by three chemicals which the underside of the plant releases; a histamine which irritates the skin, acetylcholine which causes the burning sensation and serotonin which acts as a catalyst for the other two chemicals. Having successfully managed to get stung by a nettle there are numerous ways that nature has provided to ease the symptoms. Probably the most universal cure is to break a dock leaf and rub it over the affected skin and good old Mother Nature has ensured that normally a clump of docks is always near a nettle clump. Hence the saying: “Nettle in, dock out. Dock rub nettle out“. Locally it is said that rubbing the sting with the underside of a fern leaf will also effect instant relief as does the application of ice. Another less pleasant way to ease a sting was to apply fresh urine to the skin which could prove tricky if you were stung on the elbow. One fallacy that has been handed down is that if you firmly grasp a nettle you won’t get stung, trust me don’t believe a word of it. There is also the theory that if you stroke your hand down the nettle leaf as opposed to brushing up it then you won’t get stung, again not 100%. It is also interesting to see how often nettles seem to be growing over the juiciest of fruits in the strawberry patch, is it also a coincidence that these same nettle seem to have a harsher sting than any others? In the tradition language of flowers the stinging nettle has always represented ‘cruelty’ for obvious reasons, although I can think of a few more plants which probably could carry that title. In historical terms the nettle has been used since prehistoric times, a fabric woven from nettle has been discovered in a Bronze Age tomb in Denmark. It is likely that the plant had been used earlier than the Bronze Age, certainly twine made from the stalk has been found in Neolithic contexts. I have watched nettle twine being made and once you have the knack of losing the leaves without getting stung it is a fast and easy way to make a very strong twine. Various sources have suggested that the nettle was introduced into this country by the Romans who used it as a means of keeping warm in the cold climate of Britain. How? Simple, keep drawing the nettles across your skin (known as urtication) to get the stinging and burning sensation, it is also thought that this was also a curative for rheumatism. Before leaving the world of archaeology there is one other benefit of the nettle; clumps of nettles can often indicate former areas of occupation and farm buildings used to house livestock. The nettle has even found its way into the place-names of Dartmoor in the form ‘Nettlery’ which as Hemery points out is the, “low plain at the foot of Watern Down“. However, it may very well be that the nett element actually derives from neat which means ‘cattle’. Whilst talking about cattle the young or maturing nettle was often fed as a type of fodder to livestock, it was said that when fed to dairy cows it would noticeably increase the quantity and quality of the milk yields. It has been known for a dairy farmer to give a neighbour a pint of milk for every day in April and May that he was allowed to cut nettles on his farm. The nettle has for centuries been used to make a coarse type of hard wearing cloth, and when boiled the leaves make a green dye and the roots a yellow dye. It could be said that in the one plant you have the complete kit for cloth making which was an ideal source for the poorer folk. As briefly alluded to above the stinging nettle has been well known in herbal medicine for centuries. In the Moretonhampstead area of Dartmoor it was well known that to ease the pain of the ‘rheumatics’ all one had to do was drink an infusion made from nettle leaves. The sap from the stem of a stinger is said to ease the effects of a bee sting when applied to the wound. If anybody wanted a general tonic that would keep one in the rudest of health then an infusion of nettles, dandelion leaves and watercress had to be taken on a daily basis. A cure for nose-bleed was to mash up the roots of the nettle and apply it topically to the offending nostril. In the Okehampton area a handful of nettles would be placed under the pillow of a sick person, if they stayed green then the patient would make a full recovery, if they changed colour then the prognosis was not too good. There was a tradition at many places on Dartmoor to celebrate ‘sting-nittle day which usually occurred on the 3rd of May and formed part of the May Day tradition. Third of May is Sting-Nittle Day“. On this day the children would arm themselves with huge clumps of stinging nettles and simply charge around whipping all and sunder with them. It was said that the ones in the know stuffed their pockets with dock leaves in the event that they should get stung during the excitement. “Take 2 gallons of cold water and a pailful of washed young Nettle tops, add 3 or 4 large handsful of Dandelion, the same of Cleavers (goosegrass) and 2 ounces of bruised, whole ginger. Boil gently for 40 minutes, then strain and stir in 2 teacupsful of brown sugar. When lukewarm place on the top a slice of toasted bread, spread with 1 ounce of compressed yeast, stirred till liquid with a teaspoonful of sugar. Keep warm for 6 or 7 hours, then remove the scum and stir in a tablespoonful of cream of tartar. Bottle and tie the corks securely“.